Newman was born in Louisville Kentucky before later moving to South Africa with her parents. It is there she finished the art education program at Witswaterand College before moving back to the states and continuing her education under a scholarship to the Studio School of Fashion Illustration in Cincinnati, Ohio. It is there she graduated with honors and secured her first job as a fashion illustrator. Since then, she has continued to expand upon her artistic education with part time classes at the Cleveland Institute of Art under professors such as Ed Mieczkowski, and Louis Bosa. 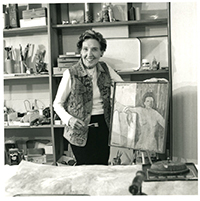 Throughout her career, Newman has worked for Guttman Candy Company, Polsky’s, Akron and Halle Brothers, and the Elise Newman Gallery on Murray Hill Road. She has participated in over 15 exhibitions and shows, including the Exhibition of American and British Artists in London, Focus:Fiber, a juried show through the Textile Alliance of the Cleveland Museum of Art, and the National Midyear Juried Show through the Butler Institute of American Art.